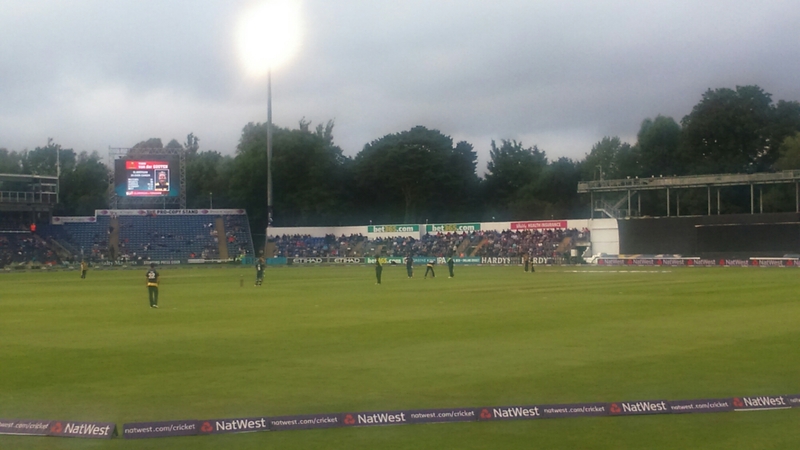 Last night I went to the Natwest T20 Blast Quarter Final match between Glamorgan and Leicestershire at the SSE Swalec Stadium in Cardiff. By beating Middlesex last week, Glamorgan finished top of the `South’ Group hence the home tie against Leicestershire who finished fourth in the North Midlands Group. In contrast to most of the rest of the competition, we had good weather: there was a bit of cloud, but it was warm and as we settled into our seats we were confident of a full match. The game was preceded by a moving tribute to the late Don Shepherd, who died last week shortly after celebrating his 90th birthday. It’s a shame he wasn’t around to experience what turned out to be a fine evening for Glamorgan cricket. Leicestershire won the toss and decided to bat first. They got off to a flying start and although Cameron Delport and Luke Ronchi were both clean bowled by excellent deliveries (the former a superb yorker from Marchant De Lange), Leicestershire emerged from the six overs of Powerplay on 57 for 2. A big score looked likely. The trajectory of the match thereafter was defined by a really excellent bowling and fielding display from Glamorgan, to such an extent that the next ten overs for Leicestershire produced just 43 runs for the loss of seven wickets. Their last wicket fell in the last over, by which time they had accumulated only 123 runs. The pick of the Glamorgan bowlers was Craig Meschede who bowled at a sharpish fast-medium, but with the wicket-keeper standing up to the stumps to frustrate the batsmen who clearly wanted to come down the wicket to make use of the short straight boundaries. He also bowled a considerable number of slower balls and cutters, but despite these variations he kept to a very accurate line. He finished with figures of 3 for 17 off his four overs, which is really excellent for this format. At the other end for much of the time, Colin Ingram bowled his leg breaks with similar accuracy and got quite a few to turn; he took the wicket of Wells with one that turned enough to take the leading edge, resulting in a simple caught-and-bowled. Ingram finished with 1-19; both he and Meschede bowled 12 dot balls in their four-over spells. All this was backed up by sharp fielding and good catching. The target of 124 never looked like being enough, although there was nervousness around the ground when Aneurin Donald holed out to mid off early on after which Glamorgan’s batsmen took some time to get the scoreboard moving. But that was just Rudolph and Ingram being sensible. They had no need to rush with such a modest score to chase. Suddenly Ingram sprang into life and took the bull by the horns. The scoring accelerated with a flurry of boundaries, the tension melted away and the Glamorgan supporters starting singing. In all, Ingram clubbed five huge sixes including one that went so high I lost it in the floodlights and feared it might land on my head. It actually landed in the crowd a few yards away but didn’t cause any injury. Ingram is an impressive player when he gets doing – he hits the ball very hard but it looks so effortless, and he’s as skilled with the rapier as with the bludgeon: many deft flicks and cuts were included in his innings. Ingram was in no mood to hang about once he’d got his eye in. 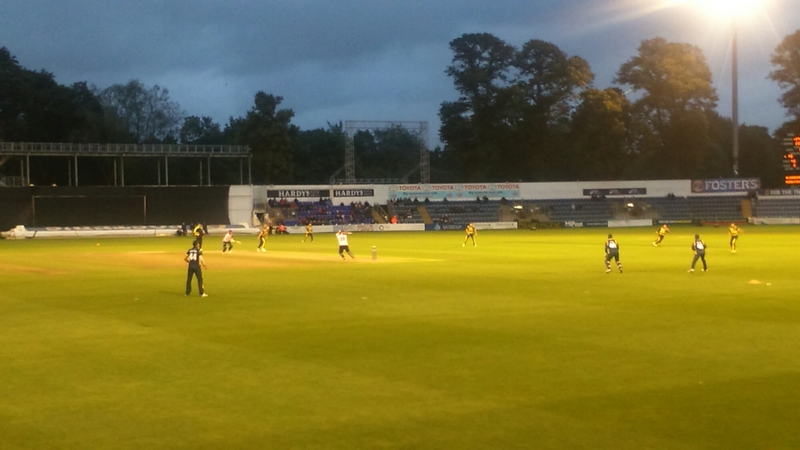 At the end of the 13th over, Glamorgan were 104 for 1. The next five balls went for 6-6-4-2-4 and that was that. Glamorgan finished 126 for 1, winning by nine wickets. Ingram finished on 70 not out having overtaken Jacques Rudolph and left him stranded four short of a fifty. Together with his excellent bowling, his batting amply justified the Man of the Match award. It had been a one-sided contest, but in a way that I found entirely satisfactory. Well played Glamorgan, and commiserations to the Leicestershire fans who played their part in creating a great atmosphere at Sophia Gardens. So there we are. For the first time since 2004, Glamorgan have qualified for the semi-finals of the Twenty20 competition, where they join Hampshire (who thrashed Derbyshire on Tuesday night); the two remaining quarter-finals are played tonight and tomorrow. Both semi-finals and the final are played on Saturday September 2nd at Edgbaston. David Miller, who had flown back for this match having played in South Africa the day before, was scheduled to bat at No. 4 last night but wasn’t needed. He may well get a game on Finals Day! This means that Glamorgan have already qualified for the Quarter Finals to take place next week. If they finish in one of the top two places they will have a home tie against the third or fourth club from the North (or, more properly, Midlands) group. If they finish third they will play away against whichever Midlands team finishes second in that group. Hampshire are also guaranteed a Quarter Final place but there are many possibilities for the other two slots: only Gloucestershire, who played their final game last night, are definitely eliminated. 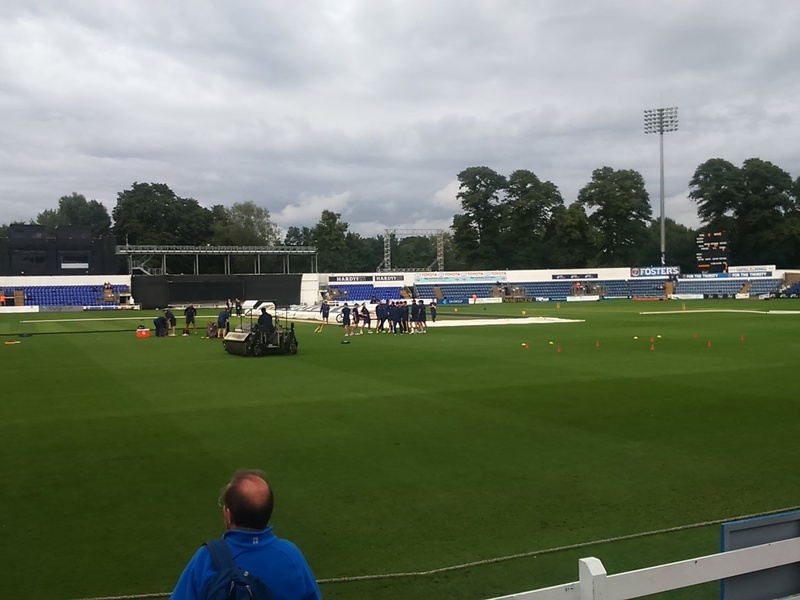 Normally, a home Quarter Final tie would regarded as a `reward’ for doing well in the group, but this season Glamorgan haven’t won any of their home games (either losing them or having them rained off). They might do better to lose tonight and play their next match somewhere else! However, if they beat Middlesex (or if tonight’s game is rained off) I’ll have another match in this competition to watch at Sophia Gardens. After that, proper cricket resumes in the form of championship matches against Sussex (at Colwyn Bay) and in Cardiff against Northamptonshire and Gloucestershire. I have to say that I find the format of the Natwest T20 Blast group matches a bit strange. It would make sense for each of the 9 teams in each division to play each of the others home and away. That would mean 16 matches per side altogether. In fact each team plays only 14 matches: each plays six teams home and away and two teams only once. Presumably that is to avoid fixture congestion, but the group games are spread over a six week period, so I would have thought it wouldn’t be too difficult to fit another couple of games in. This morning the Cardiff weather pulled out all the stops. I woke up to bright sunshine, then a few minutes later the rain was lashing down. Then we had thunder and lightning, with rain and hail, followed by more sunshine. It’s also been rather windy. It’s anyone’s guess what will happen this evening, but I’ve paid for my season ticket so I’ll try to make the best of it! I’ll update this post with pictures of the action. If there is any! UPDATE. Play was scheduled to start at 7pm. This was the scene at 7.02. Still raining. Toss delayed until further notice. UPDATE to the UPDATE: After a pitch inspection at 8pm we finally got going at 8.20, with 14 overs a side. There were a couple of short interruptions when the rain started again, but the game was completed. Glamorgan won the toss and decided to field. Middlesex got off to a terrible start and were at one point 7 for 3, and then 24 for 5. They recovered somewhat but could only reach 99 for 8 off their 14 overs. Despite a wobble in the middle when they lost 3 quick wickets, including the talismanic Ingram, Glamorgan reached the required round hundred comfortably to win by 7 wickets. Their reward is a home tie against Leicestershire next Wednesday evening. I hope the weather is a bit better then! So last night Glamorgan won a Natwest T20 Blast match against Gloucestershire by 25 runs having batted first and scored 176 off their 20 overs. 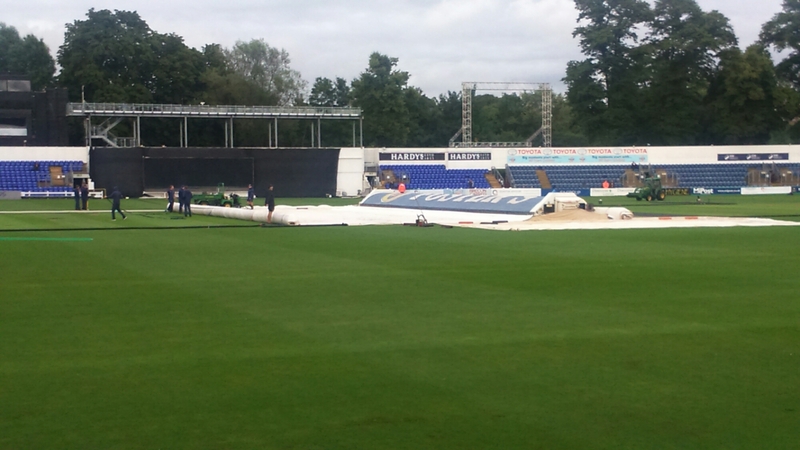 Glamorgan are now top of the `South Division’, despite having three games rained off. They play second-placed Surrey on Friday. Weather permitting. Anyhow, last night when I saw the result I got to wondering what the par score is for a first innings in Twenty20 (i.e. median score for a winning side batting first). Would you have expected them to win with a score of 176? The answer – and the answers to many other questions – can be found in this interesting post. P.S. If you can’t be bothered to read the post, the median winning score for men’s T20 matches is about 164 so Glamorgan had a better-than-even chance of winning after their first innings. 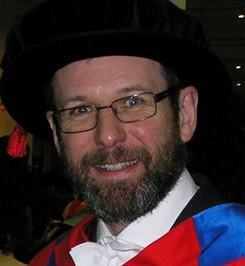 I haven’t blogged for the last two weeks – partly because life has been busy, but also because I’ve struggled to come up with anything to say that provides particular insights about individual BBL or WBBL matches that are being played. I will return to this, and will continue to post key stats about various matches on the Strike Rate twitter account. In this post, I’m posting my analysis of ‘par scores’ for T20, and how they vary between the men’s and women’s game, and in different parts of the world. This is useful for understanding what sort of score can be expected in particular conditions. 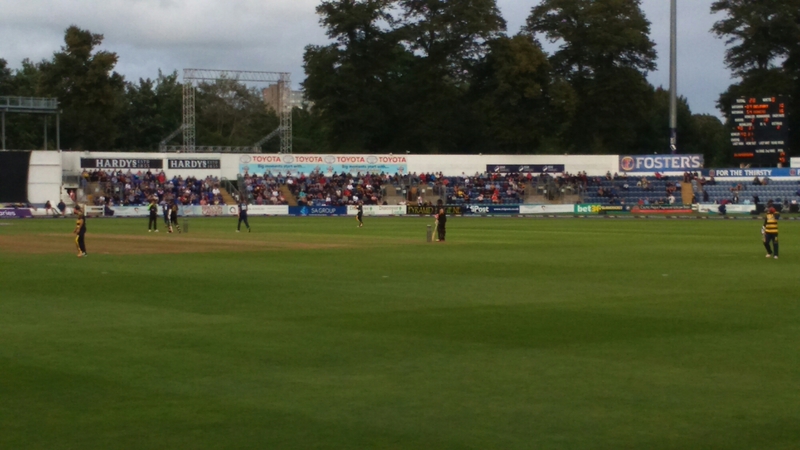 Last night’s Twenty20 match in Cardiff was planned as a staff social outing for members of the School of Physics & Astronomy at Cardiff University. I had to do some things at home before the 6.30 start so didn’t join the group that went to a pub first but went straight to the ground. The umpires inspected the pitch at 7pm, and during their deliberations it started drizzling. They decided to have another look at 7.30. I stayed inches ground, updating the rest of the staff group who happily stayed in the pub while I sat in the gloom of a sparsely populated SWALEC. The toss was finally thrown at 8pm. Glamorgan won and decided to field. 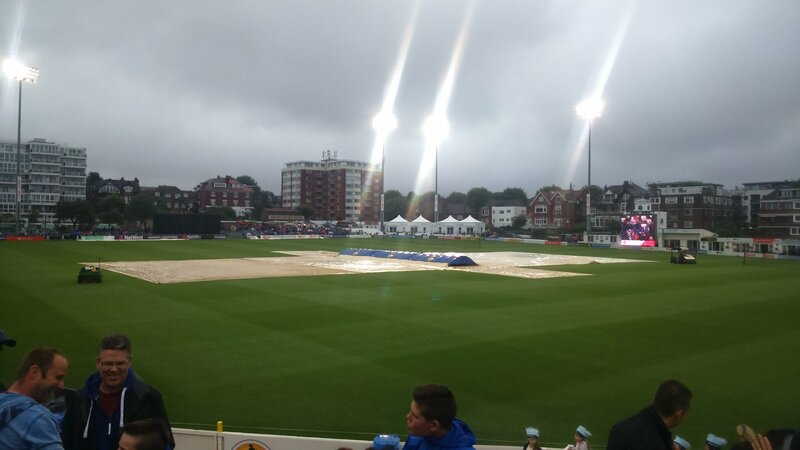 Play would start at 8.30, with 9 overs per side. Play did get under way at 8.30.. 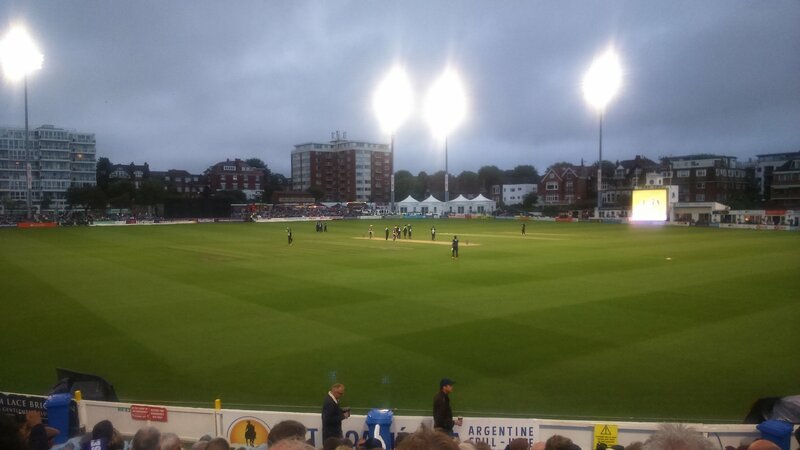 It was predictably knockabout stuff, with Sussex slogging from the word go. They reached 87 for 2 off 8 overs, but then the rain returned. A little after 9pm the game was abandoned. Fewer than 10 overs having been bowled, tickets were refunded. 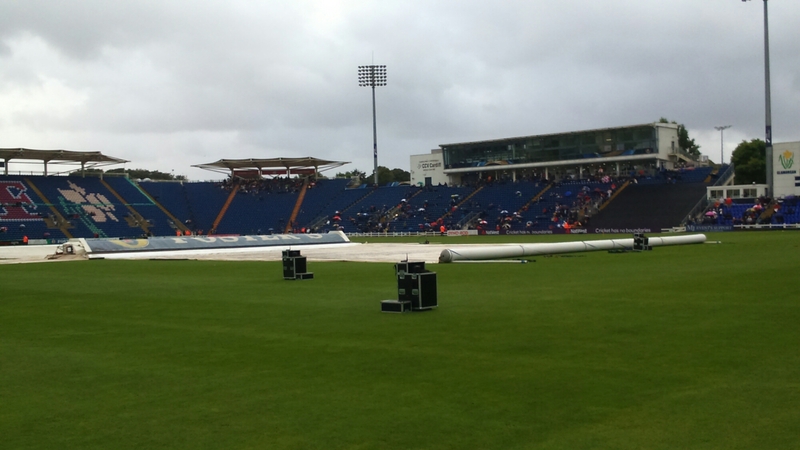 It was a shame that we didn’t get a full game, not only because the social event was a damp squib, but also because Glamorgan really wanted a win. 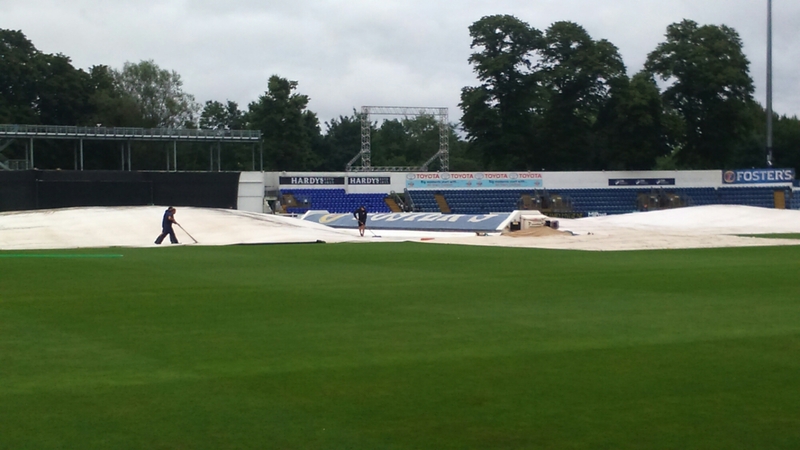 Their previous match at the SWALEC (against Somerset last Saturday) was also rained off but their match the following day against Essex in Chelmsford led to a victory with a six off the last ball as Glamorgan chased 220 to win off 20 overs. Anyway, it’s the return match against Essex in Cardiff on Sunday so let’s hope for a full game then. 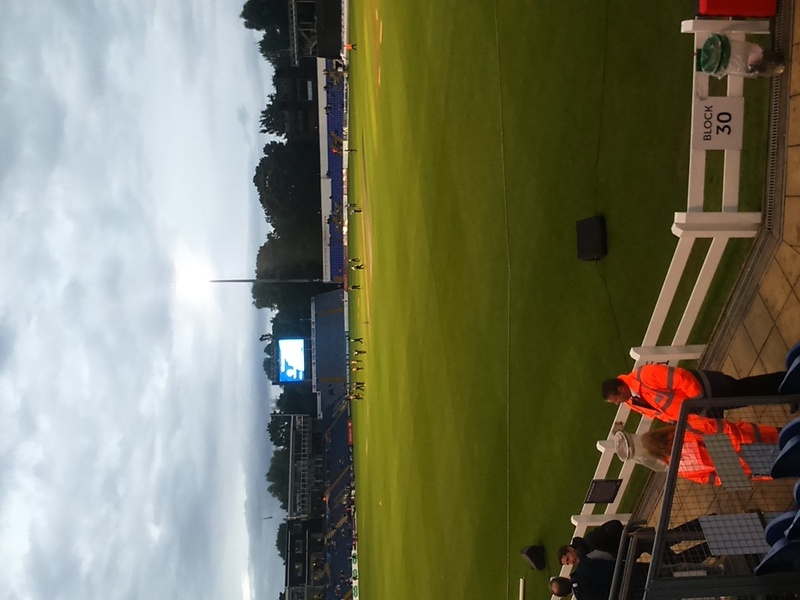 Following the Natwest T20 Blast between Sussex and Glamorgan a couple of weeks ago, I decided tonight to follow Glamorgan’s progress in the competition in their Quarter-final match in Cardiff against Yorkshire. Anyway, although it was cloudy and not particularly warm, at least it stayed dry. Yorkshire won the toss and batted, getting off to an excellent start largely thanks to the positive batting of David Willey. They reached 101 for 1 of just 9 overs, suggesting the real possibility of a score of over 200. However, they lost wickets in quick succession – including that of top scorer Willey for 79 (off just 38 balls) and their innings stuttered, eventually closing on 180 for 8. That’s a good score, but Glamorgan were probably pleased to have restricted Yorkshire to nine an over. Having watched Glamorgan’s batsmen struggle against Sussex I wasn’t exactly filled with confidence that they would reach Yorkshire’s total. They got off to a calamitous start, with opener Lloyd playing on to his first ball from Bresnan. From then on they never looked like coping with the Yorkshire bowling and were eventually bowled out in 13 overs for 90, just half of Yorkshire’s score. And it could have been worse: at one point they were 37 for 6. Anyway this leaves only four teams in the competition: Durham, Northants, Notts and Yorkshire. All – you will notice – from the Midlands.